As a comprehensive method for transforming car-dependent environments into walkable, diverse communities, Sprawl Repair includes small-scale and inexpensive interventions. Sprawl Repair works at multiple scales, from the region to the neighborhood and the building, and utilizes a variety of tools that are cost-effective, incremental, and can be quickly implemented. 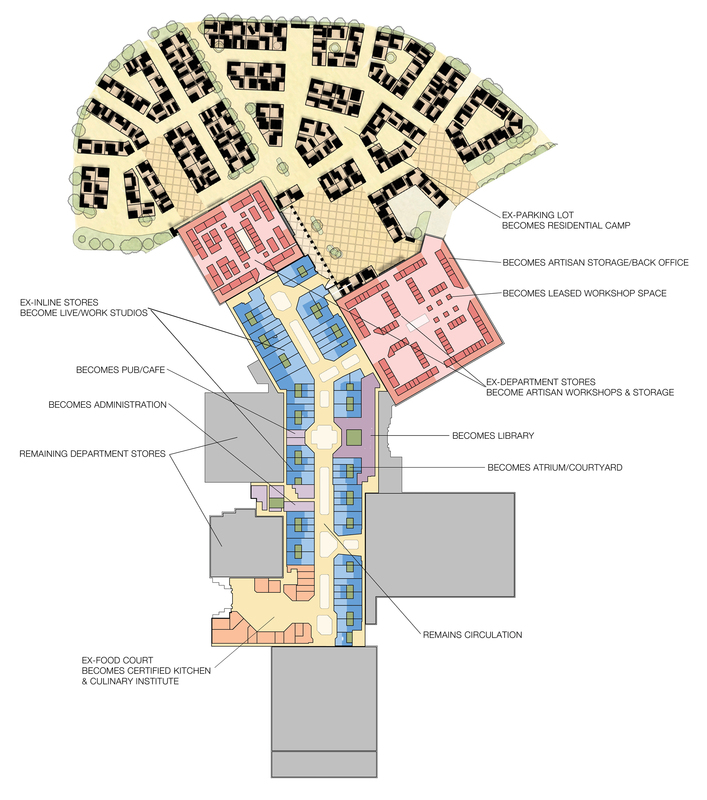 This paper will demonstrate how a mall, the most promising contender for Sprawl Repair, can be retrofitted in small, efficient steps, creating much-needed, cheap space for incubating new businesses and artisan uses, as well as providing affordable student housing. The past decade has seen the demise of hundreds of shopping centers and malls. Out of roughly 1,000 enclosed malls in the US, approximately 30% are dead or dying. In places of weak recovery and population loss, malls may languish for years, negatively impacting the surrounding suburban communities. Malls are sprawl types that are normative and repetitive, and the tools for their repair can be the same. In places of economic and population growth, malls will be retrofitted into urban cores with multiple uses: offices, residential, live-work units, and hotels that will rebalance the existing retail space. Municipalities, developers and planners need new ways to utilize and adapt such underperforming commercial properties. Having already outlived their lifecycles, these properties can provide inexpensive space for business incubation and/or affordable housing that has become scarce in recent years, as downtowns and inner-city neighborhoods have experienced a redevelopment renaissance. On the other hand, the young generation defined as the Millenials have been struggling in a post-recession economy that will persist for decades. The Millenials need opportunities to participate in the economy and start their own business initiatives. According to the Global Entrepreneurship and Development Index, the US is the most entrepreneurial country in the world; however, the business prospects for the young have been very limited in the fist decades of the 21st century. The regulatory system has become too demanding and cumbersome, too complicated to navigate. The young shy away from opening new companies, as the process is time-consuming and cost-prohibitive. Today there is an obvious need for special Pink Zone business hubs where the next generation can find their place and livelihood. These will be places with relaxed regulatory framework, where experimental work is welcome, and where new business can be learned, new business can be started and new business can flourish. Colleges and universities can play an active role in this process of enabling the next generation. They can purchase and transform languishing commercial real estate into business incubator hubs that will provide transitioning for the young people between college and working life. The above factors can be used as an opportunity for a model approach where universities purchase underperforming commercial properties, mall or strip shopping centers, and convert them into incubating free-zone, mixed-use villages. 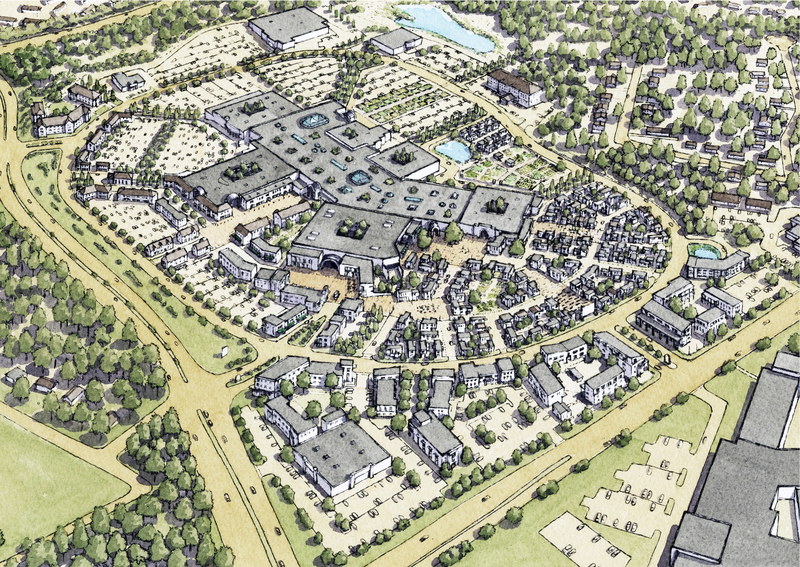 In a recent project for the revitalization of Downtown High Point, North Carolina, called Ignite High Point, the planning consultant, Duany Plater-Zyberk & Company, proposed an innovative type of repair for the Oak Hollow Mall. The mall opened on the west side of High Point in 1995, and was quite popular until the Palladium shopping complex opened five miles away. As a result, Oak Hollow Mall has been declining for the past several years. It is a typical case example of a newly opened shopping mall destroying an existing one. High Point University purchased the Oak Hollow Mall, creating an opportunity for retrofit and transformation. 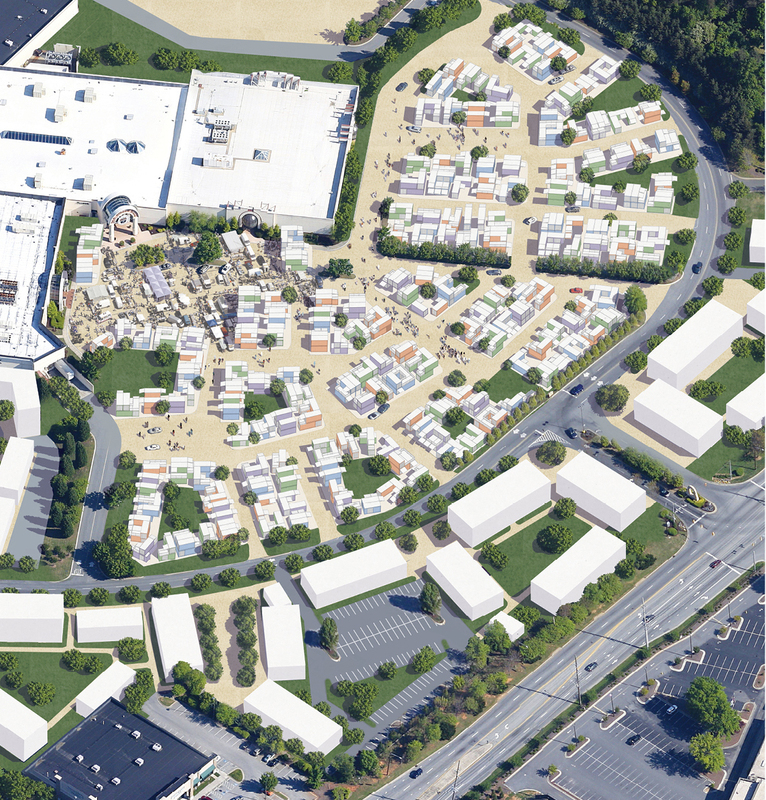 The charrette in High Point in May 2013 offered ideas for the university to utilize the mall as a teaching and working facility for young entrepreneurs, as well as a cheaper incubator space for local new businesses. The project was called Inc.Pad – “Incubator Launching Pad,” a business village in a Pink Zone that will allow mixing of activities such as learning, living, shopping, artisan light manufacturing, production and preparation of food, and dining — all in close proximity. Aerial view of Oak Hollow Mall as an example of Lean Sprawl Repair. Credit: Duany Plater-Zyberk & Co. The retrofit of the mall will take advantage of its location at an important epicenter of higher education in North Carolina (there are 336,000 college students within a 75-minute drive, graduating at the rate of approximately 50,000 per year). Currently most of those graduates go to other areas in search of better opportunities. The Inc.Pad will help attract more of those graduates to High Point. The implementation of this idea can be achieved only if there is collaboration and coordination between High Point University, private developers, the City of High Point, and state government. 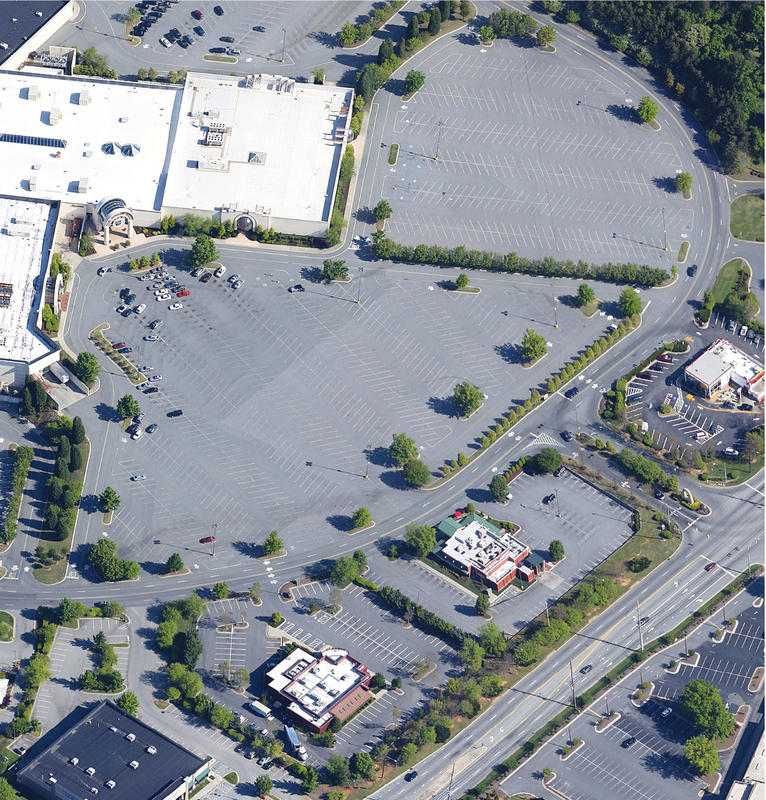 The redevelopment of the mall keeps the existing structure, as well as a substantial portion of the parking lots. The infill is concentrated on the southeast corner, as well as smaller areas to the north. The village consists of small urban blocks arranged in a picturesque fabric, creating generous civic space for socializing. The streets are narrow, accommodating pedestrians and bicyclists, but can also provide for small vehicles for deliveries. 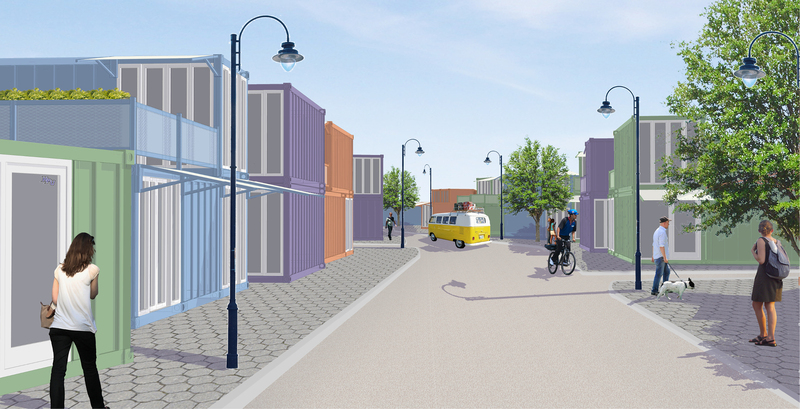 The new infill buildings are constructed with shipping containers, which will make the process easier, faster, and less expensive. Students and graduates will learn about urban and architectural design and construction methods. They will make decisions on composition, proportions, materials, colors, but also work in teams for the creation of their own community. Oak Hollow Mall: Existing Conditions. Credit: Duany Plater-Zyberk & Co. Proposed Inc.Pad. Credit: Duany Plater-Zyberk & Co. The northern portion of the mall’s parcel accommodates a community garden where local food will be produced. A prep facility is next door, while the mall’s food court becomes a certified kitchen and a culinary institute. Two or three of the former department stores are transformed into artisan workshops and storage. Some of the spaces can be leased to free-lancers for small fees. Furniture-making can be learned in these spaces, continuing the local tradition in furniture manufacturing. Some of the in-line stores become two-story live-work studios, with courtyards open to the sky on the second floor. Other stores are converted into cafes, pubs, a library, and administrative offices for the University and the management of the Inc.Pad village. The remaining anchor department stores on the west side can keep the current retail use or can be adapted as civic buildings and other uses. This side of the mall can be retrofitted in a more traditional way, incorporating liner buildings. They shape a new main street and a much-needed public square at the mall’s entrance. The liner buildings are three stories tall, with parking accommodated on the ground floor and apartments on the second and third floor. The corners receive commercial uses such as restaurants and cafes. 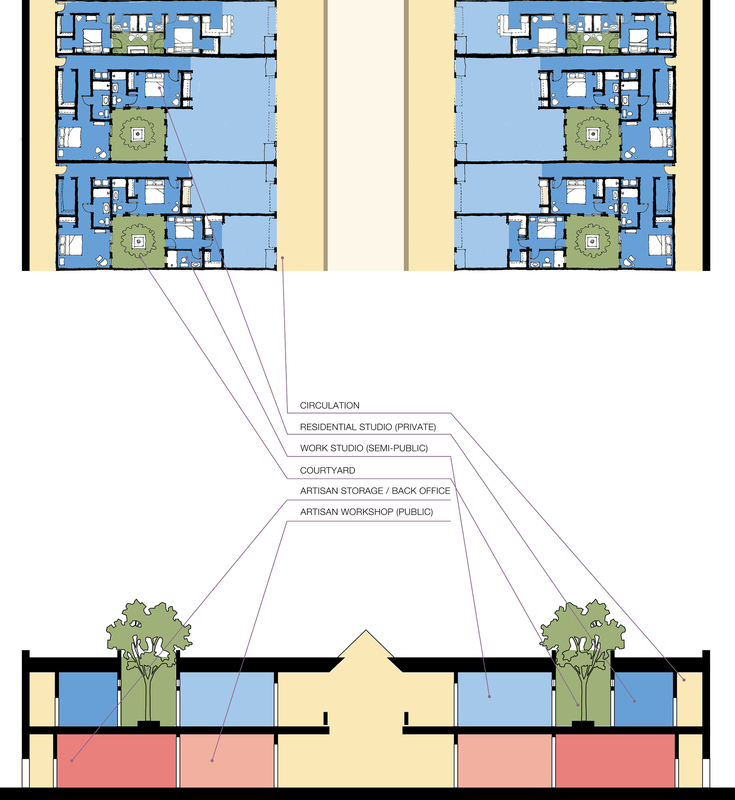 Plan of repaired mall. Credit: Duany Plater-Zyberk & Co. Section of repaired mall. Credit: Duany Plater-Zyberk & Co. Universities and colleges should purchase underperforming commercial properties such as shopping malls in vicinity of their campuses on the edges of cities and downtowns. University leadership should work together with local developers, as well as municipal and state governments, to create protocols/tools for Pink Zones on the grounds of the commercial properties. The village should be built in tandem with an adaptive reuse of the mall structure, where some of the department stores keep their current retail use if still viable, while others are converted into artisan workshops. The in-line stores are converted into civic, office and café/pub/dining uses. A Pink Code should be applied to the village to quickly and cost-effectively accommodate: a mix of uses such as residential, office, light manufacturing/artisanal production, local food production, as well as educational, civic and other uses. The Pink Zone should include revised building codes allowing for self-built structures to enable students, recent graduates and young professionals building their own residences, live-work units, and/or business and co-working spaces. 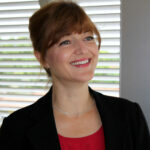 Galina Tachieva is an expert in urban redevelopment, sprawl repair, and form-based codes. As a partner at Duany Plater-Zyberk & Company, Architects and Town Planners, Tachieva directs the design and implementation of projects in the US and around the world. Tachieva is the author of the Sprawl Repair Manual, an award-winning publication by Island Press, which focuses on the retrofit of auto-centric suburban places into complete, walkable communities. Tachieva is a leader of the Congress for the New Urbanism Sprawl Retrofit Initiative, a founding member of the Congress for European Urbanism, a board member of the New Urban Guild Foundation, and is certified by the American Institute of Certified Planners (AICP) and by the US Green Building Council as a LEED-Accredited Professional.